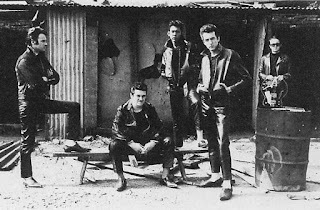 Interviewer: From these streets, very close to the Cavern Rutland, came the fabulous Rutland sound, created by the Pre-Fab Four; Dirk, Nasty, Stig and Barry - who created a musical legend that will last a lunchtime. They were discovered by their manager, Leggy Mountbatten, in a lunchtime disco very close by. 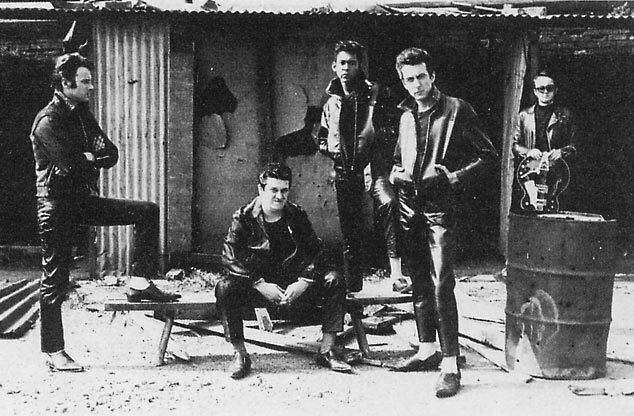 Their first album was made in 20 minutes. Their second album took even longer. 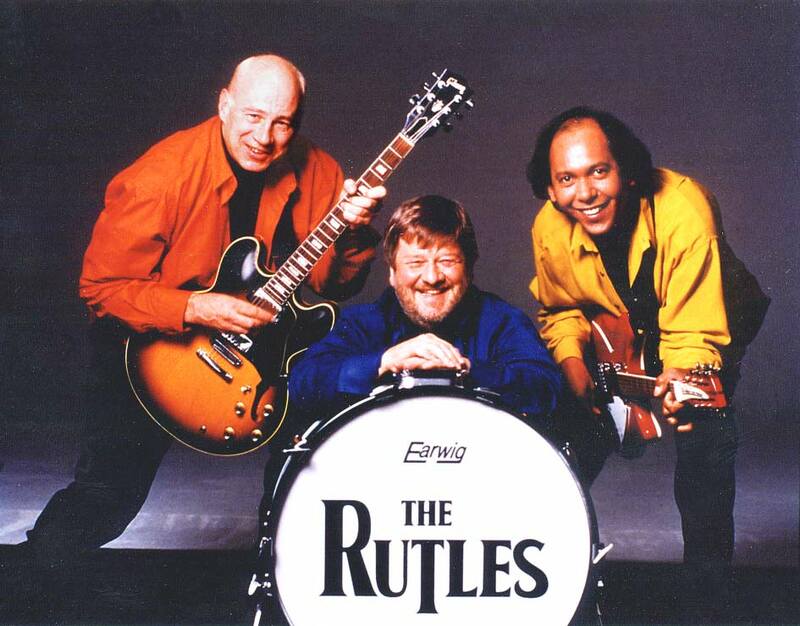 The Rutles: All You Need Is Cash is a work of genius. Absolute genius. If you haven't seen it, don't read on. Go on and buy it, watch it and then come back to wallow in this appreciation. You can buy the two albums as well ('The Rutles' and 'The Rutles: Archaeology', which deserve a proper listen). Combining the talents of Eric Idle on scripting duties and Neil Innes on songwriting duties, with them both co-leading the project on screen, it is – for me – their seminal work. It's a pitch-perfect, always-funny parody of The Beatles and it all began as a sketch on Idle's first post-Python project, Rutland Weekend Television (a TV channel with no budget, broadcasting hilarious sketches and songs). 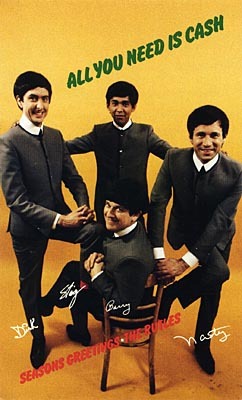 In one episode, The Rutles appeared in black and white, running around like The Beatles did in A Hard Day's Night, and singing 'I Must Be In Love'. From there, American network NBC picked it up and ran with it as a comedy special. Idle appeared on Saturday Night Live, in 1976 (a year after the initial sketch had aired in the UK); the legendary late-night comedy show in America that has nurtured, honed and bred the careers of many of the top US comedians from 1975 to the present day. Head honcho and comedy overlord, Lorne Michaels, watched the clips from Rutland Weekend Television that were shown as part of the show that Idle hosted and suggested a longer mock-documentary about the spoof band. So, in a very short space of time, Idle combined that sketch idea about an inept documentary maker and Innes's Beatles parody song and a phenomenon was born. The Pre-Fab Four, as they were known, are Ron Nasty (Neil Innes, an alternative John Lennon), Dirk McQuigley (Eric Idle, an alternative Paul McCartney), Stig O'Hara (Ricky Fataar, an alternative George Harrison) and Barry Wom (John Halsey, an alternative Ringo Starr). The pin-point accuracy of the documentary – mirroring (and sometimes including) real footage of The Beatles is sublime, as is the narration, the songs, the performances and the ending. Fortunately, at the time, all The Beatles were living, so the ending is funny rather than a parody too far. In fact, George Harrison appears in the actual mock-documentary, as an interviewer, throwing questions at Michael Palin's Press Officer, Eric Manchester. To add credence to the documentary, you get real-life musicians being interviewed about the fictional band. Mick Jagger and Paul Simon are exceptionally good value, with both of them appearing very natural and not at all like they're acting. Whether they improvised their dialogue or not, I don't know, but they are spot-on in their hollow appreciation of the band. All You Need Is Cash opens with a great gag where a camera, mounted on a moving vehicle, steadily gets faster and out of reach of the on-camera narrator (Idle) – so he has to chase after it, still speaking into a microphone, faster and faster. It never lets up from there, documenting the early beginnings in Hamburg, Germany, and right through to their solo careers after The Rutles have split up. Such was NBC's delight at what they commissioned, they moved it from a late-night 'filler' slot to a prime-time 'promoted' slot. It is, and should be, lauded as the most perfect and most appreciative homage. Spinal Tap came close, for Heavy Rock/Metal, and A Mighty Wind delved into the world of Folk and Country, but nothing comes as close as All You Need Is Cash. It's evidently clear how much The Beatles are loved by Idle and Innes, in the way they've managed to re-create scenes, footage and newsreels, as well as lampooning every high and low point of the band's fairly short career. With NBC's money input comes American talent too, with Saturday Night Live's alumni contributing with some great characters (Bill Murray, Dan Aykroyd, John Belushi, Gilda Radner, etc) and director Gary Weis co-directing the project with Eric Idle. Like all the best scripts, there's so much quotable dialogue that it rivals repetition on the scale of Monty Python by fans. The deadpan but cheeky Liverpudlian delivery is there in abundance and, even though Gwen Taylor's brilliant Chastity - an alternative Yoko Ono - is a proper dig at Yoko's supposed controlling nature and seemingly confused Live Art background, John Lennon was sent a preview copy of the video and the LP (yes, no DVD and CD in those days!) and he refused to return it because he liked it so much. Neil Innes wrote the incredible songs and they're not slavish parodies (though some sail very close to the originals), so it's honestly like getting access to new Beatles material from the archives. 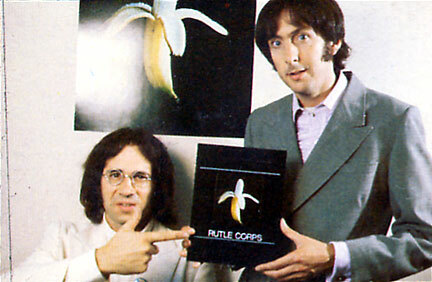 It may be blasphemy but I actually prefer reaching for my Rutles album than a Beatles one. Yikes. I think that's probably the ultimate accolade. Interviewer: Some people say you've been staying away from Liverpool, now you're famous. Interviewer: Some people say it's six months since you came back here. Barnaby Eaton-Jones (BEJ): Neil, hello! Neil Innes (NI): Ah, hello, hello, hello! BEJ: I'm going to leap right in with my first question and it's about the timeframe of writing the songs for The Rutles, when the American NBC Special came along. How long did you have to write and record all that was needed for All You Need Is Cash? NI: Well, the short answer is about 3 months. BEJ: Wow. And there were a lot of songs to be written! BEJ: And then they gave you 3 months, that's very nice of them. Ha. 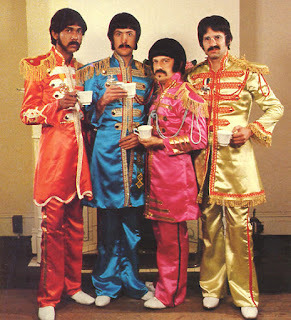 NI: When they said 'Can you write 20 more Rutles songs? ', I said 'Well, I'll try!'. So, I didn't totally commit. Ha ha. BEJ: I was going to ask you about the original song – 'I Must Be In Love' – from the Rutland Weekend Television show. I just wondered whether that idea was something you brought along originally or something that was already on the table? NI: Well, it was my idea to do a spoof of A Hard Day's Night (the first film by The Beatles) because the whole thing about Rutland Weekend Television was that it had to be cheap ideas, and you can't get much cheaper than four blokes in wigs and tight trousers running round a field in black and white. And the song was just a sort of an easy list: 'I feel good, I feel bad, I feel happy, I feel sad. Am I in love? I must be in love.' So, I sent this idea to Eric and he said 'Oh, that's great, I can pair it with this idea I've got of a documentary maker who has a camera that always runs away from him!' - and that's how it was born. Just a song that was a list, with an interesting Middle 8, that wasn't particularly Beatle-like, but we sort of made it fit. BEJ: So, how close did you veer to the original Beatles songs in All You Need Is Cash? NI: I didn't listen to any Beatles songs at all. I thought, if I do that, I'm going to be sunk. I just tried to remember where I was when certain Beatles songs came out. Then, when I'd written them – so that I could play them on just a piano or just a guitar – then I knew they would stand up as original songs. Then, when we recorded them, we listened and listened to The Beatles to get the feel and the production right. For example, John Halsey – the drummer – said 'There's bongos on this track!' and I'd say 'You're right!' and we'd include them. So, it was as much down to George Martin, the producer, as it was The Beatles. Because he made them sound right, which we needed to do too. BEJ: And, in 1996, when you returned to do another album as The Rutles ('Archaeology', which apes The Beatles 'Anthology' release), did you find those songs easier to write or harder, because you'd done it so well before? NI: Well, some of those ones were already written, you know. Things like the song 'Questionnaire' was the one that made me think I'll have another go, because it was about gun sales and things like that. So, I popped down to see George (Harrison), to see what he thought, and I started playing him some of the songs and he couldn't recognise anything and said 'Hang on, these are YOUR songs! Don't be shy, get them out there.' and I thought The Rutles was the best platform for them. And it's funny, if you do them – well, I call it 'Rutle-ease' – if you do them in a Rutles accent and you do some of the wonderful production things that George Martin did originally, you start making The Rutles sound. But, you know, 'Eine Kleine Middle Klasse Musik', and songs like that, were my songs anyway that we just turned into The Rutles. BEJ: Did you ever think about putting them out as you, originally? NI: I don't fall into any comfort zone in the popular music sphere, so it's difficult to get my voice heard but when I had my arm twisted to do another Rutles album I thought 'Where's the fun in that?' because it's not exactly the same happy-go-lucky thing it was because one had been killed. In fact, I remember saying to George when I approached him with the songs, I said 'Should I do more Rutles? I'm thinking about it.' and he immediately said, with that subtle wit of his: 'Oh yeah?! Which one of you is going to get shot?'. But, you know, he said do it because it's all part of the soup. BEJ: So, did you ever hear what John Lennon ever thought about your Ron Nasty character? NI: Oh yes. John and George had a similar sense of humour – dark, informed – whereas Ringo's a bit lighter but I think the only person who didn't really like it was Paul (McCartney). NI: I mean, he puts a brave face on it but I think he hates it. BEJ: Which is a shame, when you're coming from a place of loving affection rather than spiteful sarcasm about the whole thing. I was going to ask about the meticulous detail that went into All You Need Is Cash, and I suppose that's maybe why it was so close to home for Paul, as it really gets everything right and maybe brings some bad memories back? But, the fact it became so big in its own right, maybe irked him. Were you surprised by the level of success and recognition it gained? NI: Oh, very much so. Firstly, I thought it was going to be a one-off for Rutland Weekend Television. Secondly, when we suddenly had the good fortune - and interest of the American public – from Saturday Night Live to make the whole story. I mean, the team behind Saturday Night Live is very, very good and it was Gary Weis, who was used to shooting things from the hip, and he was just shooting good stuff. Anything we couldn't really afford, we'd just say 'Well, it's not The Beatles, it's The Rutles' and get round it that way. It was one of the happiest projects I've ever worked on. BEJ: I come from a sort of comedy improvisation background and some of the, like Press Conference moments, they seemed improvised rather than tightly scripted. Did you go off script much? NI: No, not really, as the script was so good but we'd often throw things in. Like the 'Do you feel better after meeting the Queen' line, from the Press Conference, that was a real line from a Beatles Press Conference after they'd received their gongs, and Eric added the 'No, you feel better after seeing the Doctor. ', 'Not, my Doctor, you don't. ', 'Not his Doctor', things like that. But, the bit in the bath, when you're introduced to Ron's girlfriend Chastity, that was improvised and I had to do it twice because the whole crew were laughing so much. Gwen Taylor (who played Chastity), you can see that's she's going and we just couldn't afford another take. BEJ: I just wanted to also touch on the fact that there's now actual tribute bands – apart from Oasis* - actual tribute acts to The Rutles themselves, like there are with The Beatles, which I assume must be quite weird? NI: Well, it's lovely. It's really lovely. And what's nice is when we go out and do it live, people know the songs so well and they are great songs to play live in front of an audience. I suppose the only cloud again, after 35 years, I became entitled to reclaim the copyright in American, which I did. And now Sony, who jointly-own the Beatles songs, are saying they are going to take a tough line on this because they consider them to be derivative works. NI: Yes, I know. It's got to the point of them threatening a lawsuit and I'm there thinking this is not right because 'derivative work' is a sort of generic term for any popular song! BEJ: That's very true! Wow, that is amazingly shortsighted of them. That's just bizarre. But, then I suppose that happens to quite a lot of creative people. NI: Well, yes, I know, but I'd be keen to find out who it really is. Is it Sony Music or is it Paul (McCartney)? BEJ: I really hope it isn't and someone comes to their senses soon. Just to ask one final question, though, and veering slightly off-topic – even though I adore The Rutles songs – my favourite song of yours is 'How Sweet To Be An Idiot'. It's actually one of my absolute favourite songs of all time. I first heard it when watching the Monty Python At The Hollywood Bowl concert and wondered how was it for you playing there, in front of all those fans? Even though you were essentially part of Python then because you'd contributed to the last series when Cleese had left, I'm assuming people didn't know it or may not have heard it before? NI: Yes, it went very well. In fact, Carl Reiner, Rob Reiner's Dad (Carl is a comedy legend, whereas Rob directed another seminal music spoof Spinal Tap), came up to me afterwards and said it was a beautiful song. My only thing about it was I couldn't do it with a duck on my head, a plastic one of course, which I'd lost (Innes wears a rubber duck on his head for the cover of the album, which also uses the song title, as well as the official video from Innes Book Of Records). BEJ: But, the beret you wore was a good substitute. NI: Well, the Python office were ringing up Woolworths in New York, saying 'Where are the quacksies? ', 'We don't have any 'quacksies', sir.' and having the most Pythonesque conversation. I couldn't get another one, so I had to wear the beret for the Hollywood Bowl. BEJ: It is a truly great song, with or without the rubber duck on your head! NI: And, of course, Oasis did a song called 'Whatever', which was deemed to be very close to 'How Sweet To Be An Idiot'. So, when we did The Rutles 'Archaeology' album, we put the tune to 'How Sweet To Be An Idiot' into the song 'Shangri-La' and sang some words from 'Whatever'. BEJ: I absolutely loved that, it was so beautifully ironic considering Oasis are an alternative reality version of a Beatles tribute band. NI: Well, of course, Barnaby, the best quote on that was by Douglas Adams. BEJ: What was that? I should know this, I'm a Douglas Adams fan! BEJ: What did he say? NI: He said, 'They're not even as good as The Rutles!' But, I'm jesting, because Noel (Gallagher) is a Rutles fan, which makes him alright! BEJ: And so, finally, what's next for you, Neil? If you don't mind me asking? NI: Well, I'm off to see my friend Elliot Randall (Steely Dan's guitarist) and we're working on a few things together. BEJ: Neil Innes, thank you very much! * Oasis – a popular UK band of the 1990s onwards, with warring brothers, Noel and Liam Gallagher - would often boast of their re-working of Beatles songs to make their own and their love for the band, but one of their hits was so much like a Neil Innes song, he was able to receive a credit and royalties on it.